This year many cities in the Southeast have already exceeded their average rainfall by over 20%. As a result, we’ve heard many stories about flooding and 500 year flood events in the Atlanta area and elsewhere. I wondered about the ability of tree planting to affect stormwater. I have seen various reports referring to the benefits of trees based on their ability to reduce stormwater through evaporation of rainwater which lands on its leaves and branches back into the atmosphere, and through the infiltration of rainwater into the ground reducing the total amount of runoff and also affecting the peak flows by making slight reductions to the volume of stormwater runoff. Over the past few decades, American Forests has developed an analysis that they refer to as an Urban Ecosystem Analysis (UEA) in over 40 metro areas in the U.S. These reports quantify a number of benefits provided by trees especially relating to stormwater benefits , air pollution reduction and carbon sequestration. The assessment is based on specific GIS modeling of tree canopy for regional and site specific areas within each municipality it studies. The GIS studies also show that impervious surfaces have increased by 20% over the past 2 decades in urban areas. American Forests has developed tree canopy goals for various areas in the United States, with the following recommended generally for cities east of the Mississippi. I noted that several southeastern cities had had an Urban Ecosystem Analysis including nearby Chattanooga and Knoxville. I also found some data for Charlotte/Mecklenburg County. One of the critical items that the UEA measures is loss of tree canopy. Some of the losses noted are staggering. Between 1984 and 2001, Mecklenburg County (Charlotte, NC) lost over 22% of its tree cover and 22% of its open space. Over that same time period, the county’s impervious surfaces increased by 127%. By comparison between 1974 to 1996 Chattanooga and its nearby neighbor, Atlanta, both lost 17% of its regional tree cover. Even with the dramatic percentage of loss noted in Mecklenburg Co, the 2002 UEA still noted that Charlotte, whose city limits are within Mecklenburg County, still exceeds the Tree Canopy Goals mentioned above at 49% Tree Canopy. The city’s tree canopy is valued of $398 million dollars based on a total stormwater retention capacity of Charlotte’s existing urban forest of more than 199 million cubic feet. This translates into a value of approximately $398 million dollars (based on construction costs estimated at $2 per cubic foot to build equivalent retention facilities). 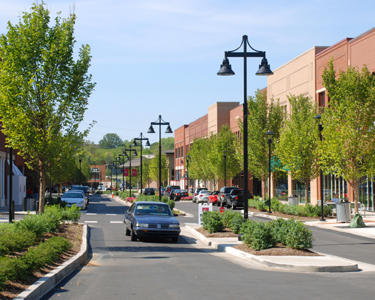 Chattanooga comparatively achieved a Tree Canopy Goal of 22.5%. In a ten year period from 1989 to 1999, Knox County (Knoxville, TN) lost a less dramatic 2.2% of its regional tree cover. Knoxville’s tree canopy measured at 40% of the total land area just met the 40% American Forest Tree Canopy Goal. This was assessed by the UEA to have a value equal to $280 million dollars.. This value is based on a total stormwater retention capacity and related construction costs to build equivalent retention facilities noted in the above Charlotte example. UEA also quantified that the tree cover in Knoxville sequesters more than 2.3 million pounds of pollutants from the air, with a value of more than $5.9 million. As we consider the goal of increasing our Tree Canopy cover and, especially, the American Forests recommendation of 15% Tree Canopy cover for central business districts, consider that the Knoxville UEA study and The Green Build-out Model: Quantifying the Stormwater Benefits of Trees and Green Roofs in Washington, D.C . completed in 2007, noted a difference in a tree’s stormwater benefit based on whether it was over a pervious or impervious surface. The D.C. report modeled that trees over impervious areas, such as a sidewalk or parking lot, provided a stormwater benefit that was over 5 times that of a tree over a pervious surface such as grass or planting beds. The Knoxville report further noted that it requires ten or more newly planted trees to equal a single large mature tree’s ecological value. Research has begun on a light weight alternative to extensive green roofs (the least intense form of a green roof) for when structural loads or costs might otherwise deter a client from choosing to pursue a green roof. It is being referred to as a ‘green cloak’ and uses fast growing vine species that attach to a trellis suspended above the roof. Laura Schumann, a graduate student at the University of Maryland completed her thesis on the cost benefits for temperature and stormwater using green cloaks. More complete information on temperature and stormwater reduction can be found on the University’s website. While green cloaks will likely never provide near the benefits of an actual green roof system, a major potential is that they are probably a less expensive option when installing a green roof is just too cost prohibitive and a client is still looking for a way to save on energy costs. In addition to reducing cooling costs and slowing the runoff of stormwater from roofs, one of the most intriguing facets may be the potential for using vine and trellis systems on sloped roofs where it is currently challenging to implement traditional green roof systems. Another aspect is that vines have the potential to provide cover for vertical surfaces and may help provide even greater temperature benefits when combined to cloak walls as well. The vine species researched in the study included 5 different species: cross vine (Bignonia capreolata), kudzu (Pueraria lobata), Japanese Honeysuckle (Lonicera japonica), porcelain berry (Ampelopsis brevipedunculata), and Virginia creeper (Parthenocissus quinquefolia). One drawback may be that green cloaks might not be as aesthetically pleasing to the masses as green roofs and could be a hard sell for more refined urban or retail areas. And it may also be difficult to provide full coverage for large roofs, however even partial coverage could provide huge cost savings in cooling costs for big box retailers or manufacturer’s with large warehouses where load bearing capacities for roofs are low and aesthetics are not as much of a concern. Either way, this is another potential option available for designers to help reduce energy costs, the urban heat island, and reduce stormwater runoff. It has been three years since the American Society of Landscape Architects (ASLA) finished the 3,000sf green roof on top of the their headquarters building in Washington D.C. The green roof is unusual in that it is sloped to cover the mechanical units on the roof. An informative video (link to video) was posted on Youtube this month highlighting the stormwater benefits of the ASLA roof. Nancy Somerville, ASLA’s CEO was interviewed during the video and she stressed the important role green roofs could play in helping address Washington D.C.’s and the nation’s difficult stormwater issues (i.e. water pollution, Combined Sewer Overflows). An EPA report estimated 850 billion gallons of untreated sewage and stormwater are discharged nationally each year as combined sewer overflows. (EPA Fact Sheet [pdf]) As Ms. Somerville points out, green roofs can filter the stormwater falling on the roof as well as act as a sponge and significantly reduce the amount of stormwater coming off of the roof. 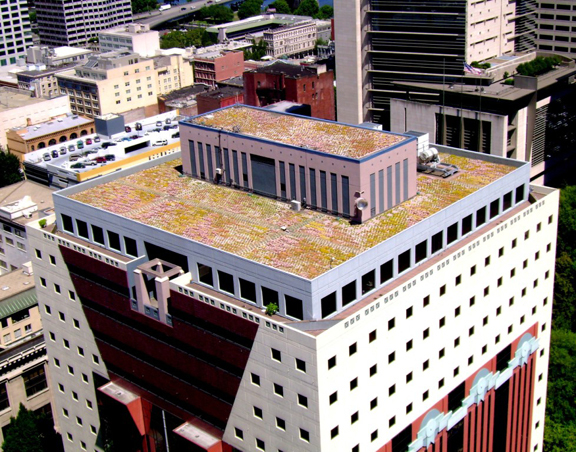 A green roof with 4″ deep planting media has been shown to retain 63% of the rain fall hitting the roof. The roof typically retained 100 percent of a one-inch rainfall. The heaviest rainfall during the monitored period was March 16, 2007. A total of 2.48 inches of rain fell during the 24-hour period with the roof retaining 51 percent, the equivalent of 1.3 inches of rain. The green roof did not add any nitrogen to the runoff. Because of the amount of water retained, the roof provided a significant reduction in the amount of nitrogen introduced back into the watershed. Typical of “young” green roofs, the analysis showed higher amounts of some other nutrients such as phosphorus, as well as heavy metals in the runoff—all below EPA standards and below levels expected from street runoff. Based on other green roof research, nutrient levels are expected to decrease in a few years. The heavy metals may be coming from the roof materials or from settled particulate matter/pollutants. It is important to note that this study did not look at runoff from a conventional roof compared to the green roof runoff—and the results would be expected to look different. Water quality testing will be repeated in two years to see how the results change over time with a goal of comparing the green roof runoff to conventional roof runoff. The green roof has been as much as 32 degrees cooler than conventional black roofs on neighboring buildings. Engineering analysis showed that the green roof created a 10 percent reduction in building energy use during winter months and negligible difference in the summer. On a city wide level, the Casey Tree, a non-profit dedicated to restoring, enhancing and protecting the tree canopy of the Nation’s Capital, conducted a study (link to study) of the Washington D.C. area that examined the impact of green roofs and tree plantings. They concluded that if 55 million square feet of green roofs were installed throughout the Washington D.C. area, they would reduce the reduce CSO discharges by 435 million gallons or 19% each year. 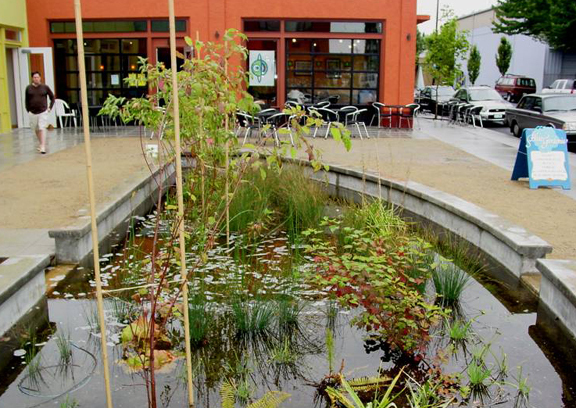 These studies illustrate the effectiveness of including green infrastructure within the overall strategy for cleaning up our nation’s stormwater. Tags: Benefits, EPA, Green Roof, stormwater, Washington D.C.